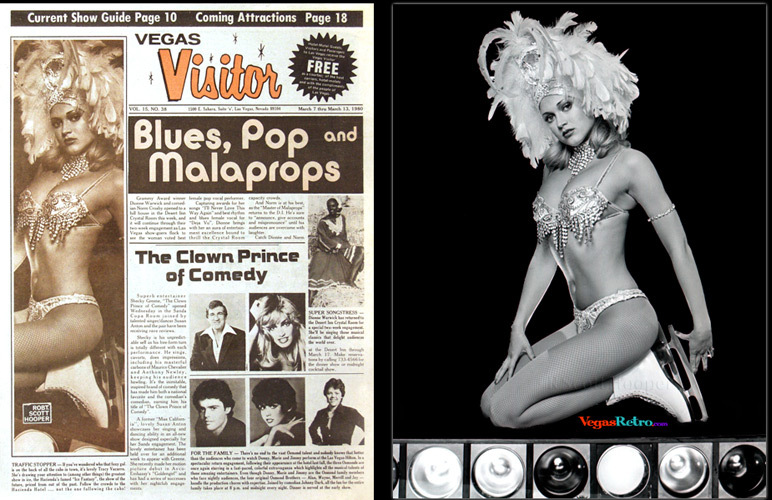 IN THE NEWS March 7, 1980 - Shecky Greene, the Clown Prince of Comedy opened the Copa Room at the Sands with singer/dancer Susan Anton, while family entertainment can be found at the Hilton with the Osmonds, including Marie. Vegas Visitor Cover Girl Caption TRAFFIC STOPPER - If you've wondered who that foxy gal is on the back of all the cabs in town, it's lovely Tracy Vaccaro. She's drawing your attention to (among other things) the greatest show in ice, the Hacienda's famed "Ice Fantasy", the show of the future, priced from out of the past. Follow the crowds to the Hacienda Hotel...not the one following the cabs!